Opening Ceremony of 17Th National MTB & 9th Down Hill championship. President of South Asian Olympic Council/ President of NOC/Member of Parliament Honorable Jeevan Ram Shrestha was the Chief Guest on Opening Ceremony of 17Th National MTB & 9th Down Hill championship. Honorable Shrestha said that there is very high prospect of Mountain biking in Nepal. The view of Cycling as a sport has now developed a lot in Nepal and now with Cycling being included in SAF Games 2019 the popularity of this sport will also bloom. 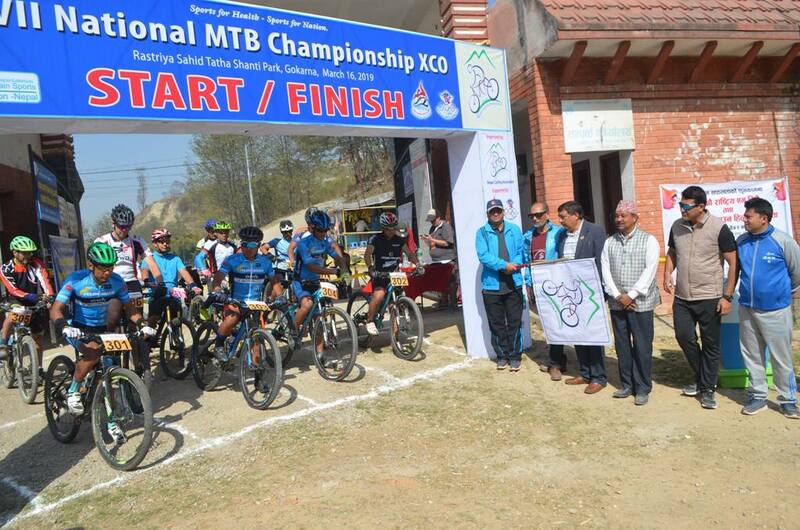 Rajiv Rai and Laxmi Magar won the titles of the 17th National MTB Cross Country Championship here at the national Martyrs and Peace Park on Saturday. Rai finished the 20 km race in one hour and 31.32 seconds in the men’s section. Pratap Thapa was second in 1:31.39, while 0kwsh Bajracharya came third in 1: 34.03. In women’s section, Magar came first in one hour and 45.49 seconds while Sony Gurung was second in 1:51.57 and Humi Budha Magar finished third in 2: 11.22. Likewise, Deepak Jimi won the junior section title, while Harka Lama came first in master’s category. A total of 51 riders took part in the event.